This Thanksgiving I am grateful for the example of the Pilgrims, who left comfortable homes in England to come to America. 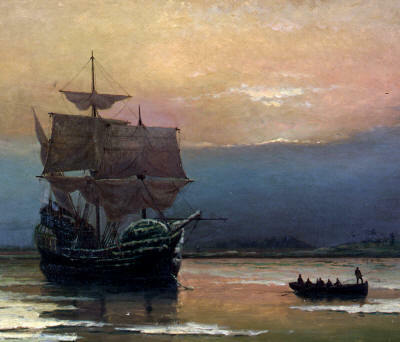 Some 102 passengers boarded the Mayflower to find religious freedom and more fulfilling lives. Before they landed, the pilgrims signed the "Mayflower Compact" in which they said the trip was "undertaken for the Glory of God and Advancement of the Christian faith." Half of those who started the arduous journey died on the 66-day voyage. On November 21, 1621 they arrived in Plymouth. In their first harsh winter, dozens more died. A Patuxet Indian named Squanto taught them to grow corn and where to fish, and negotiated a peace treaty between the Pilgrims and the Wamponoag Indians. At the end of their first year, after their harvest, the Pilgrims held a great feast honoring Squanto and the Wamponoag - and to thank God for their deliverance. William Bradford, who arrived on the Mayflower and served as governor of Plymouth Colony for more than 30 years, wrote a first-hand account of the Pilgrims' journey, called Of Plymouth Plantation. Of their hardships endured in seeking freedom that first year, he wrote, "But these things did not dismay them...for their desires were set on the ways of God and to enjoy His ordinances, but they rested on providence, and knew whom they had believed." Perhaps they were comforted by these words by the Apostle Paul, written to the Philippians while he was chained in a Roman prison: "I have learned to be content whatever the circumstances. I know what it is to be in need, and I know what it is to have plenty. I have learned the secret of being content in any and every situation, whether well fed or hungry, whether living in plenty or want. I can do everything through Him who gives me strength." Today in America we have so much to be thankful for. Millions have immigrated to this land for opportunity - and found it. First, they have landed jobs to support themselves and their families. Today's 3.7% jobless rate is the lowest in 50 years. Second, religious freedom is universal. In fact, the text of the First Amendment to the Constitution states that "Congress shall make no law respecting an establishment of religion, or prohibiting the free exercise thereof;" During President Eisenhower's term, the nation's motto became "In God we trust." The remarkable result is that 73% of Americans are believers and only 18% say they have no faith. Six in 10 say religion is an important part of their life. About 49% are Protestant, 23% are Catholic while 2% are Jewish and .8% are Muslim. What's particularly striking is that weekly religious attendance is 31%, down only 1% in a decade. However, marriage in America is in deep trouble. Half of U.S. marriages have divorced since 1975. In 2016, for example, there were 1,159,000 divorces compared to only 2,245,000 marriages, for a 51.6% divorce rate. While 93% of Americans say that "having a happy marriage" is a very important goal, the number of never-married Americans nearly quintupled from 8.7 million in 1970 to 41.3 million in 2015. There were actually more marriages in 1970 than in 2015! The primary killer of marriage may come as a surprise - cohabitation. The number of couples who were living together was only 430,000 in 1960 - but that soared 18-fold to a stunning 8 million by 2016. Only 1.3 million of that number married. What happened to the other 6.7 million? Most broke up or were on the path to do so. And those who do marry are more likely to divorce than those who remained apart before the wedding. Yet have you ever heard a sermon on cohabitation? I bet not. Sadly, many cohabiting couples have children - and 40% of American births are to unwed parents - 20 times Japan's unwed birth rate of 2%. Children of divorce or of cohabitation fare poorly in America. They are three times more likely to be expelled from school or to have a child as a teenager as those from intact homes, are five times more apt to live in poverty, six times more likely to commit suicide and 12 times more apt to be jailed. This Thanksgiving, let's thank God for marriage, and do more to cherish and reenergize our own marriages, urge our children to refrain from living together and encourage our churches to preach powerfully on the importance of His first institution.